Lancashire and Yorkshire Academy Origin squads to face the Australian Schoolboys this autumn. There are four new faces in the Lancashire squad: Christian Kellett, who joins eight of his St Helens team-mates in the side. Wigan Warriors’ Reece Hamlett and Sam Halsall and Oliver Leyland of London Broncos, who is the only representative in either side from a Southern club. The Lancashire side will be coached by former Rochdale Hornets coach Ian Talbot, supported by two-time Steve Prescott Man of Steel winner, Paul Sculthorpe. 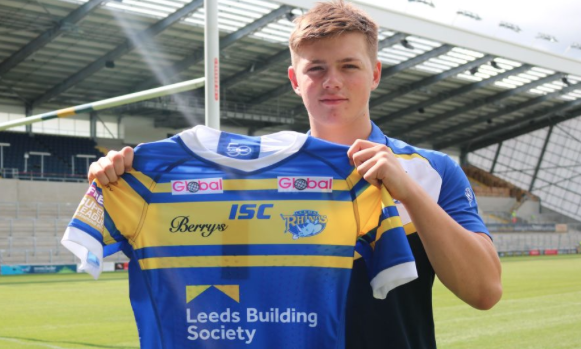 Leeds Rhinos dominate the Yorkshire ‘Origin’ squad with eight representatives including call-ups for Muizz Mustapha, Callum McLelland and Tom Holroyd. City of Hull Academy players Conor Wynn, Elliott Wallis and Jack Brown are also new additions to the squad, alongside Robbie Storey of Castleford Tigers and Newcastle Thunder’s Rory Nettleton. Lancashire Origin Squad in full: Aiden Roden (Wigan Warriors), Ben Davies (Widnes Vikings), Christian Kellett (St Helens), Ethan Havard (Wigan Warriors), Jack Welsby (St Helens), Jake Wingfield (St Helens), James McDonnell (Wigan Warriors), Jarrod O’Connor (Widnes Vikings), Jayden Hatton (Widnes Vikings), Joe Sharratt (St Helens), Joe Shorrocks (Wigan Warriors), John Hutchings (St Helens), Josh Simm (St Helens), Matthew Foster (St Helens), Nathan Wilde (Wigan Warriors), Oliver Leyland (London Broncos), Reece Hamlett (Wigan Warriors), Sam Halsall (Wigan Warriors), Sam Royle (St Helens), Tom Nisbet (St Helens). Yorkshire Origin Squad in full: Muizz Mustapha (Leeds Rhinos), Callum McLelland (Leeds Rhinos), Conner Wynne (City of Hull Academy), Corey Johnson (Leeds Rhinos), Dom Young (Huddersfield Giants), Elliot Wallis (City of Hull Academy), Jack Broadbent (Leeds Rhinos), Jack Brown (City of Hull Academy), Jack Flynn (Huddersfield Giants), Keelan Foster (Bradford Bulls), Lewis Carr (Castleford Tigers), Lewis Peachey (Castleford Tigers), Louis McConnell (Leeds Rhinos), Mikey Lewis (City of Hull Academy), Owen Trout (Leeds Rhinos), Robbie Storey (Castleford Tigers), Rory Nettleton (Newcastle Thunder), Rowan Milnes (Bradford Bulls), Tom Holroyd (Leeds Rhinos), Tyler Dupree (Leeds Rhinos).